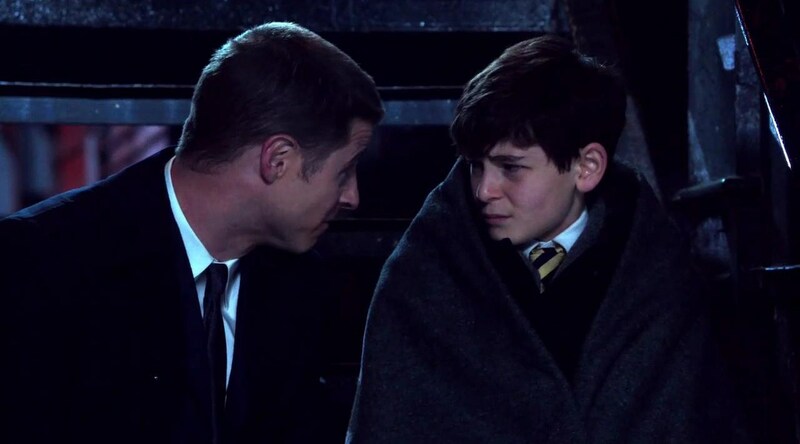 Detective Gordon (McKenzie) comforts a shattered Bruce Wayne (Mazouz). There are parts of the pilot for “Gotham” that just don’t work, from some overly stylized camerawork and set pieces or the shoehorning of some iconic characters into the story; however, there is plenty left that will leave viewers satisfied that there may be something really good going on in this series that looks at the famous world of Batman before the Dark Knight takes flight. What worked first and foremost was the exceptionally strong ensemble cast, chief among them, Donal Logue, Jada Pinkett Smith, and Robin Lord Taylor. The actors chew the scenery just enough because they’re playing larger than life characters, but they never veer too far off into the cartoonish (which is always a fear with comic book adaptations, right?). As Detective Harvey Bullock, Logue is gruff and probably the most layered character of the bunch. Bullock’s tactics and his approach to justice are questionable, but Logue’s natural charisma keeps you interested to see what he will do next. While the show would appear to be about the voyages both Bruce Wayne and Detective Jim Gordon will likely make over the course of “Gotham”, should it be a success, I found myself deeply interested in the path Bullock may find himself going down as the city eventually takes an even darker turn. McKenzie spends a good amount of the the pilot episode of “Gotham” glaring at the rest of the cast, which was immediately reminiscent of the first episode of the “The OC”, the series that introduced McKenzie to the world. The actor appears to be struggling to find the core of the character, while Logue plays Bullock so comfortably that you’d think he’s portrayed him for years. Perhaps it’s some of the stiff dialogue McKenzie is forced to deliver to establish that he’s a good guy, but the actor doesn’t get the same opportunities to shine as do his fellow cast members. Pinkett Smith is electric as the criminal entrepreneur Fish Mooney, an original character who is fierce enough to stand toe to toe with any of Gotham’s criminal element. The actress exudes coolness, but also knows how to command a fearsome presence. She is downright scary as she corners one of her lackeys, never raising her voice as she calmly lays out the details of his deception. We’re well aware that she’s about to do something really bad to him. Taylor goes just enough over the top as Oswald Cobblepot, a right hand man with aspirations for more. Taylor is joyfully sadistic in the role, but is given enough time in this initial episode to demonstrate that he can also play the role subtler when required. Fish Mooney (Pinkett Smith) and Oswald Cobblepot (Taylor) share a love of crime, but that’s about it. Writer Bruno Heller (“The Mentalist”) is having a blast writing the villains above everything else. And why wouldn’t he? Batman arguably has the greatest cast of bad guys in the history of comics and Heller is just warming up. Unfortunately, the desire to showcase Batman’s famous Rogues gets a little out of hand. Selina Kyle (Camren Bicondova) serves no purpose to the story other than to slink silently in the background, watching Bruce Wayne’s world fall apart. The brief and unnecessary inclusion of Poison Ivy (Clare Foley) is even more superfluous to the story. However, Cory Michael Smith appears for a few moments as Edward Nygma and he’s playful enough to leave us wanting more of the man who will eventually become the Riddler. Heller’s script takes a few dives when the dialogue becomes uninspired, as in the scene between Gordon and Bruce. The writer has a lot of ground to cover in this opener that puts a large cast of characters in place as well as a handful of subplots. Unfortunately, there are more than a few scenes where the dialogue suffers as a result. Director Danny Cannon goes overly stylized in some sequences where it doesn’t seem at all necessary. There are a a couple of scenes that are lit so heavily or that it almost begins to look like a dream sequence. As Gordon pursues a murder suspect in another scene, the camera appears attached to him and the background jerks manically as the detective races down several flights of stairs. These nuances are more distracting than they are visually arresting. Young Bruce is not the focus of the pilot, but we do eventually come back to him as Gordon continues his pursuit of George and Martha’s killers. David Mazouz is fine as Bruce, but Heller’s script pushes the character into his quest to face his fears a mite quickly. However, there’s a powerful moment towards the end of the episode when Bruce reveals his assertiveness that is more telling of the man he will eventually become. To be clear, the following is not a criticism, just curious observation. We know that Gordon is searching for the man who killed Bruce’s parents, but what is going to tie all of these characters together for the next several seasons? From the preview to the second episode we see that Gordon is going to stop by Wayne Manor again for another heart to heart with Bruce, but how many times are the creators going to be able to do this before the scenes lose their sincerity? It would seem more effective to tell two separate stories within “Gotham”. First, show how the rise of a new style of criminals in Gotham shapes both Gordon and Bullock. Second, the transformation of Bruce Wayne into Batman. There is certainly room for these stories to connect, but it should be done so sparingly. Minor quibbles aside, “Gotham” has a strong premise and some exceptionally promising casting choices that ought to make for an entertaining new series.